Who is that little green 'guy' ? He is funny, enthusiastic, a little pigheaded, incredibly serious, sometimes a little too busy and at other times completely immersed in thought. Yes, indeed, we are talking about the Grendel monster. Everyone on the staff at Grendel games has a little bit of the Grendel monster inside him or her. The monster can spend days on end quietly sitting in its cave pondering over a difficult problem, to rush out of it, full speed ahead, ready to conquer the world at another moment. But where does this monster actually come from? The monster was born at the source from which all creative things originate: inspiration, amazement and that excited feeling you get when you see, read or hear something special. This is also what happened to Tim, one of the founders of Grendel Games. He read Beowulf, a story based on an Old English, epic and heroic poem and in which an important role is played by a monster called Grendel. Grendel lives in the water and is described by the team as an anti-hero. When Tim, together with a few other enthusiastic game makers, was looking for the name of a games company, he immediately thought of the fearless monster Grendel. If you squint a little, you can recognize the face of a monster in this first logo. In 2016 Grendel Games decided to have a new house style and logo created. This task was once again given to Anne, who threw herself upon it with great enthusiasm. 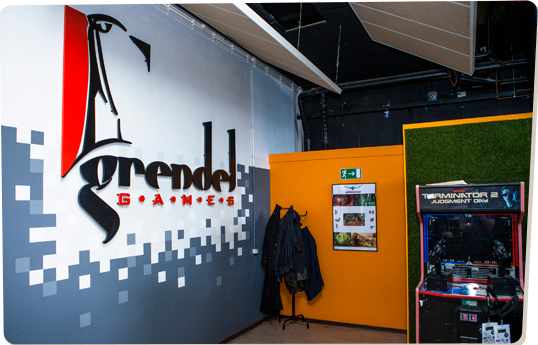 After a brainstorming session with her colleagues at Grendel Games – in a Grendel cave created especially for this purpose – Anne obtained enough input to design the logo. In a number of phases, Anne sketched the logo and the monster until the definitive logo had been designed. Tim, who had difficulty letting go of the old logo, reluctantly agreed to this revamping, on condition that the colour red would be used in the new logo. This is why the monster has a blood-red arm that is not connected to its body and that appears to lead a life of its own, and which you will also see recurring throughout this website.